Herbert A. Simon 司馬賀: labyrinth 迷宮；Herbert Simon 訪 Borges (1899-1986) ； "Labyrinths"
labyrinth 迷宮；Herbert Simon 訪 Borges (1899-1986) ； "Labyrinths"
2 Anatomy a complex structure in the inner ear which contains the organs of hearing and balance. It consists of bony cavities (the bony labyrinth) filled with fluid and lined with sensitive membranes (the membranous labyrinth). Zoology an accessory respiratory organ of certain fish. To his modern admirers, Donatien Alphonse François, Comte de Sade was also a revolutionary, one of the first writers and thinkers to explore the darkest labyrinths of the human soul. The jury is out on whether Sade was, in the contemporary sense of the word, a “sadist”. THE Argentine writer Jorge Luis Borges might seem an unlikely candidate for Man Who Discovered the Internet. A fusty sort who from the 1930s through the 1950s spent much of his time as a chief librarian, Borges (1899-1986) valued printed books as artifacts and not just for the words they contained. He frequently set his stories in a pretechnological past and was easily enthralled by the authority of ancient texts. 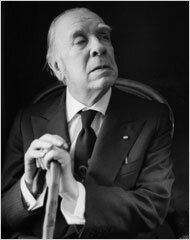 Jorge Luis Borges in 1977. Yet a growing number of contemporary commentators — whether literature professors or cultural critics like Umberto Eco — have concluded that Borges uniquely, bizarrely, prefigured the World Wide Web. One recent book, "Borges 2.0: From Text to Virtual Worlds" by Perla Sassón-Henry, explores the connections between the decentralized Internet of YouTube, blogs and Wikipedia — the so-called Internet 2.0 — and Borges's stories, which "make the reader an active participant." Ms. Sassón-Henry, an associate professor in the language studies department of the United States Naval Academy, describes Borges as "from the Old World with a futuristic vision." Another work, a collection of essays on the topic from Bucknell University Press, has the provocative title "Cy-Borges" and is expected to appear this year. Among the scores of Borges stories, a core group — including "Funes the Memorious," "The Library of Babel" and "Tlön, Uqbar, Orbis Tertius" — first appeared in the United States as "Labyrinths" in the early 1960s. With their infinite libraries and unforgetting men, collaborative encyclopedias and virtual worlds conjured up from the printed page and portals that watch over the entire planet, these stories (along with a few others like "The Aleph") have become a canon for those at the intersection of new technology and literature. By 1955 Borges had lost his sight yet was appointed director of the National Library of Argentina. Assessing his predicament (the digital age predicament) of having access to so much information and so few ways to process it, Borges wrote in "Poem of the Gifts," "No one should read self-pity or reproach into this statement of the majesty of God, who with such splendid irony granted me books and blindness at one touch." What follows are excerpts from prophetic Borges short stories — translated by Andrew Hurley in "Borges: Collected Fictions" (Penguin Books) — and examples of those prophesies fulfilled. NOW Wikipedia, the online encyclopedia project that began in 2001, now has a total of more than nine million articles in more 250 languages. There are more than 75,000 "active contributors," many of whom remain anonymous. As it grows and becomes ever more influential, its operating logic remains a mystery. A favored saying among Wikipedia's contributors is: "The problem with Wikipedia is that it only works in practice. In theory, it can never work." Now The path from diary to blog to the frequently updated "microblog" has now descended to "life-logging." Not content merely to record their thoughts or even daily activities, life-loggers record and preserve everything they see, hear, say and read during the day. The world-recognized early adopter is Gordon Bell, a 73-year-old computer programmer who wears an audio recorder as well as a tiny camera that snaps a picture every 60 seconds. A 2006 profile in Fast Company described Mr. Bell as at one time being "worried about filling up his hard-drive space too quickly." He adds a gigabyte of information a month and figures that an average 72-year-old person would require one to three terabytes, "a hefty amount of storage." Now There once was a time when a poet could assert that "the revolution will not be televised." But today, of course, even a politician's informal meet-and-greet will be recorded for posterity. Senator George Allen of Virginia learned this in 2006 when a tape of him calling his opponent's videographer a "macaca," a racially tinged epithet, spread like a virus across the state and, soon, the world. He lost his re-election bid. Through a twist of fate that the author of Labyrinths himself would have relished, these lost lectures given in English at Harvard in 1967–1968 by Jorge Luis Borges return to us now, a recovered tale of a life-long love affair with literature and the English language. Transcribed from tapes only recently discovered, This Craft of Verse captures the cadences, candor, wit, and remarkable erudition of one of the most extraordinary and enduring literary voices of the twentieth century. It stands as a deeply personal yet far-reaching introduction to the pleasures of the word, and as a first-hand testimony to the life of literature. Tonight's Art Moment is "Glass Labyrinth" by Kansas City native and acclaimed artist Robert Morris. This sculpture is a true labyrinth with one single path. Visitors walk from the entrance to the center and must retrace their steps to the exit. Labyrinths are found throughout history—in prehistoric cave drawings, ancient Greek mythology and in the stone floors of French cathedrals to guide meditative walking. Contemporary in form and material, "Glass Labyrinth" is a popular interactive part of the Sculpture Park.